I’ve loved the look of light tables for a while now, they seem so inviting and offer so many possibilities for sensory play. To buy a full sized light table can be quite expensive, and also take up a lot of space in the home, so inspired by Tinkerlab I decided that rather than just looking longingly at all the cool light table activities on Pinterest we could just make our own. And so the diy mini light table was born. This took under 5 minutes to make – it’s seriously quick and easy! If you follow the tutorial in the Tinkerlab book, you will be able to make a larger DIY light table but for our first try we used what we had to hand and made the mini table which is big enough for one child to use at a time to explore shapes and colours. One of the messages I took from the fantastic Tinkerlab book is to use what you have available, adapt, and get creative with your resources. So if you have different materials available and your light table comes out slightly different – then that’s fine! White paper to diffuse the light. You can use tracing paper, tissue paper or in fact we just used a thin piece of A4 paper and it worked fine maybe because our lights were all condensed into a small space, the amount of light coming through to the top was still pretty strong. Our lights have different settings – flashing fast, slow, or remaining on as a steady light. 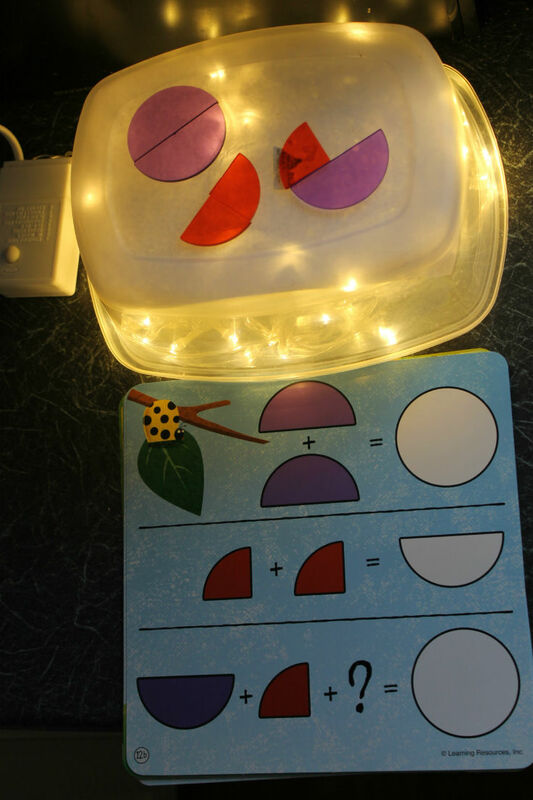 We worked with the steady light but I kept the switch accessible for the children to experiment with making patterns with the lights. We used white lights but you could also experiment with colour changing lights, especially if you have lights that rotate through colour sequences. This is something I’m sure we’ll try soon! 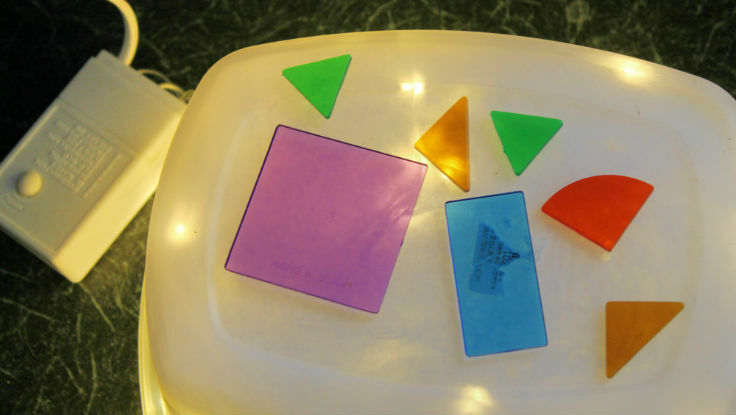 On the light table we placed transulcent coloured shapes (these are from Learning Resources) which work well on the flat top of the light table and also tried adding a deeper tray to contain water beads on the light table. This would also work for materials like salt or glitter that need to be contained. 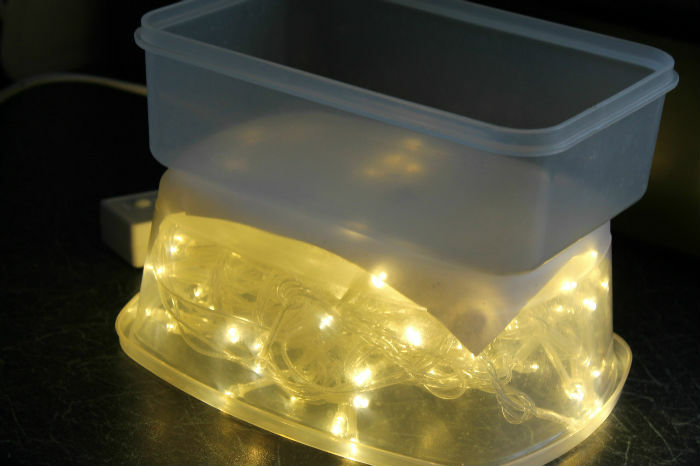 To make the light table deeper, we simply added another clear tupperware container on the top. You could tape this around the sides to make it more permanent, but we just placed it on and the boys knew to keep it there and not knock it over! 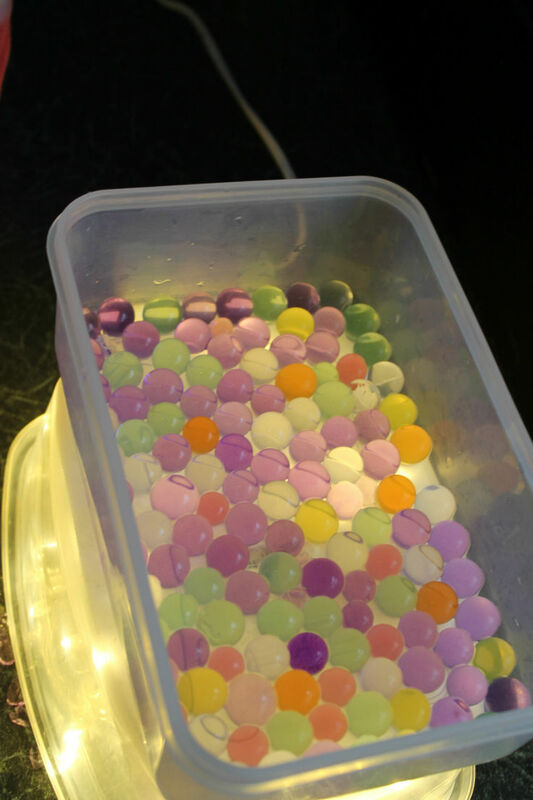 This worked brilliantly with water beads, and Mr R in particular was totally transfixed with them. He spent a lot longer on this activity than I had thought he would. He loved it so much! I’ll share another post soon with more ideas and pictures from our sensory play with water beads on the light table, as I have so many pictures! 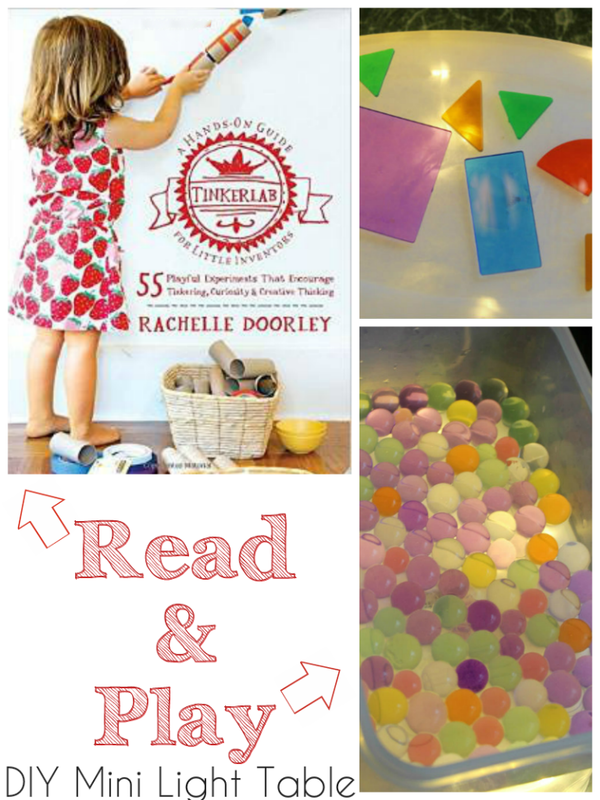 This play idea was inspired by Tinkerlab: A Hands On Guide for Little Inventors by Rachelle Doorley, the mom behind the amazing Tinkerlab blog. The book has sections full of activities split into design, build, concoct and discover but it’s more than just a kids activities book. It will inspire you to try out the ideas included and to come up with lots more of your own. It’s a book about allowing kids to experiment and be creative. After reading it, I didn’t just come away with lots of awesome crafts and activities to try (although I did come away with plenty added to our to do list!) but it gave me a renewed passion for encouraging the kids to create, letting them think outside the box and letting them tinker. 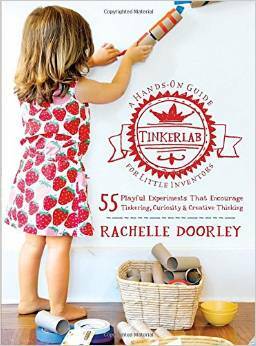 Buy Tinkerlab from Amazon (UK) (affiliate) or Amazon (US). It’s currently the #1 best seller in the Crafts for Children books category – and for good reason! This looks like so much fun 😀 I presumed making a light table would be really tricky, glad to see its not! What a fantastic and cheap idea. Guess who will be raiding their tupperware shelf now! I’d always wondered how to get water beads involved on the light box. Your table is so colorful! I love how you used it for math practice too! this looks great! We’ve never tried a light table before either so I’m excited for this option.